On May 30, 2018, General Secretary of the Central Committee of the Communist Party of China (CPC) and President Xi Jinping held talks in Beijing with visiting General Secretary of the Central Committee of the Lao People's Revolutionary Party (LPRP) and President Bounnhang Vorachithh of Laos. They both stressed to promote the building of China-Laos community of shared future for new results to better benefit the two countries and the two peoples. Xi Jinping pointed out that Comrade General Secretary Bounnhang Vorachithh and I have met frequently in the past few years. We have achieved mutual visits within the year of 2017, and various consensuses reached by us are being actively and effectively implemented, bringing tangible interests to the people of the two countries. I put forward for the first time in 2013 that China and Laos are the community of shared future that enjoys extensive common interests, which received high appreciation from Laos. I have reached important consensus with Comrade General Secretary Bounnhang Vorachithh on jointly building the community of shared future with strategic significance between the two countries. The consensus was written into the joint statement of the two countries, and it received extensive recognition from the two parties, the two countries and the two peoples, and demonstrated the significant guiding role for the relations between the two parties and the two countries, pushing bilateral relations to step into the best period in history. 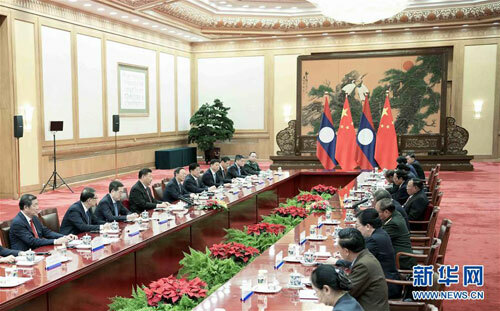 Xi Jinping stressed that as China-Laos relations have entered into the new development stage, both sides should, on the foundation of consolidating the consensus of the community of shared future, focus on the building of the community of shared future, and promote its transformation from concept to action, and from vision to reality, in a bid to let China-Laos community of shared future take root and deliver results. The first is to enhance strategic communication, and consolidate the political foundation of the community of shared future. Both sides should conduct all-round, multilevel and institutional dialogues and exchanges to constantly elevate the level of mutual trust. The second is to deepen practical cooperation, and tighten the ties of interests of the community of shared future. Both sides should focus on promoting the cooperation in major projects under the framework of the "Belt and Road", strengthen cooperation in people's livelihood and poverty alleviation, and integrate central and local efforts, in a bid to form new cooperation pattern for the two countries. The third is to reinforce security cooperation, and cement security defense line of the community of shared future. Both sides should enhance coordination and cooperation in multilateral mechanisms such as the United Nations, East Asia cooperation, and the Lancang-Mekong Cooperation to effectively safeguard the common interests of the two countries. The fourth is to activate people-to-people and cultural exchanges, and consolidate the public opinion foundation of the community of shared future. The awareness of the community of shared future should truly take root among the public and get deeper into the grassroots through nongovernmental exchanges as well as people-to-people and cultural exchanges. The fifth is to attach importance to ecological protection, and promote the sustained development of the community of shared future. Both sides should strengthen exchanges and mutual learning on ecology and environment protection, as well as explore and blaze the new path of a green community. 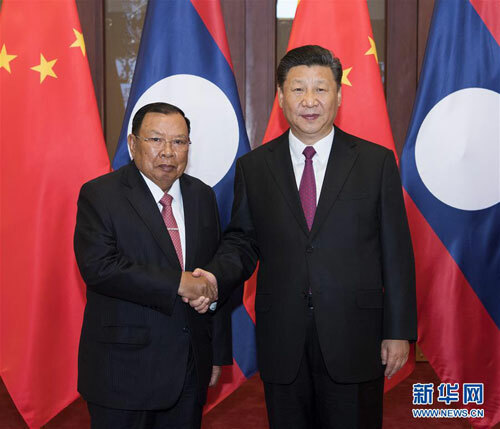 Bounnhang Vorachith expressed that Comrade General Secretary Xi Jinping is a trusted and close friend of the LPRP, the government and people of Laos. The various consensuses reached by Comrade General Secretary Xi Jinping and him during Xi Jinping's visit to Laos last year are now being actively and comprehensively implemented, guiding relations between the two parties and the two countries to new heights. He completely agrees with Comrade General Secretary Xi Jinping's guiding ideas on advancing the building of Laos-China community of shared future and stands ready to further give play to the political guiding role of the relations between the two parties for Laos-China relations, maintain regular high-level meetings between the two parties, strengthen exchanges of experience in party building, state governance and administration and practical cooperation between the two governments in various areas, accelerate the advancement of cooperation in major projects under the framework of the "Belt and Road" between the two countries, and intensify coordination and cooperation in international and regional affairs, so as to jointly and well build an unbreakable socialist community of shared future for Laos and China and benefit the two countries and people in the region. Both sides also briefed each other on the situation of respective party building and domestic development. Xi Jinping expressed his congratulations on the new achievements made by the LPRP Central Committee with General Secretary Bounnhang Vorachithh as its head through uniting and leading the people of the whole country since the 10th LPRP National Congress. Briefing Bounnhang Vorachith on the achievements and experience of China's reform and opening up, Xi Jinping stressed that China will take more proactive and enterprising actions to promote a higher level of opening up, so as to make greater contributions to the prosperity and development of Asia and the world. Bounnhang Vorachith noted that under the leadership of the CPC Central Committee with Comrade Xi Jinping at the core, China has been continuously scoring new achievements in economic development, social harmony, the cause of reform and opening up as well as the process of building a moderately prosperous society in all respects, and that China has played an important role in international and regional affairs, and made prominent contributions to the peace and development of Northeast Asia and the world. The Lao side expressed its heartfelt gratitude to China for the long-term and selfless support and assistance. After the talks, the two heads of state jointly attended the signing ceremony of relevant cooperation documents. Ding Xuexiang, Yang Jiechi, Chen Xi, Zhao Kezhi, He Lifeng and others attended above activities.